Orders of the day at Sweet Suite 2017, were fun and easy to follow. If you’ve watched a television news or talk show segment about toy trends in the last couple of year’s it’s almost certain you’ve seen “Toy Insider Mom” Laurie Schacht doing the demonstrations. Laurie and the Toy Insider team have built a reputation as the go-to mavens for broadcast and online information about what’s hot on the horizon of play. 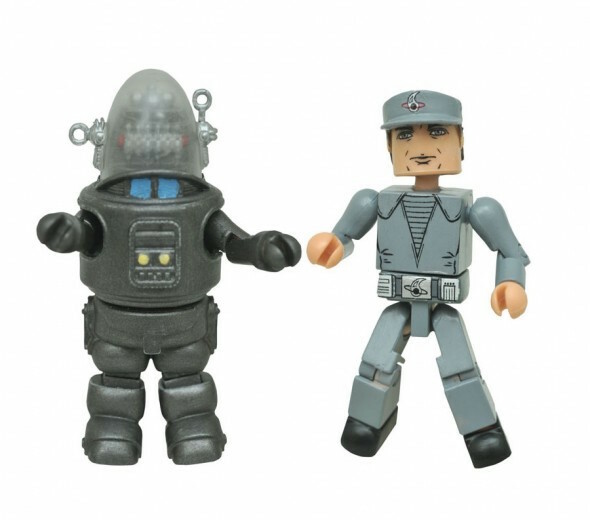 Toy Insider’s pre-gifting season lists point to the best of what’s on the market. Their hashtag, #WeKnowPlay, is not a boast – it’s a fact. 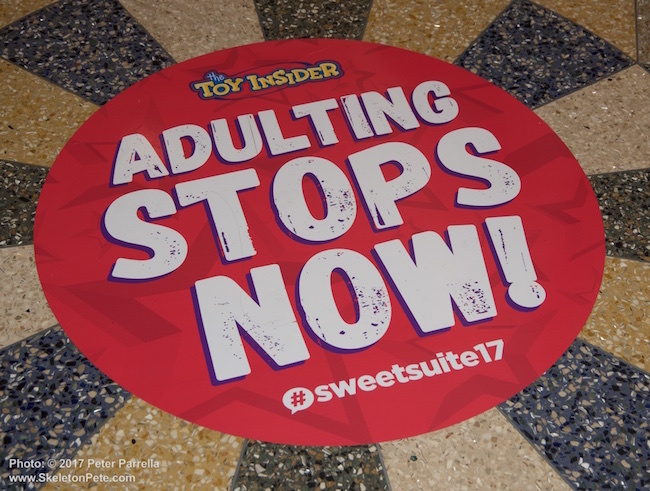 An impressive array of toy vendors will preview new goodies at Toy Insider’s 2017 Sweet Suite Event. 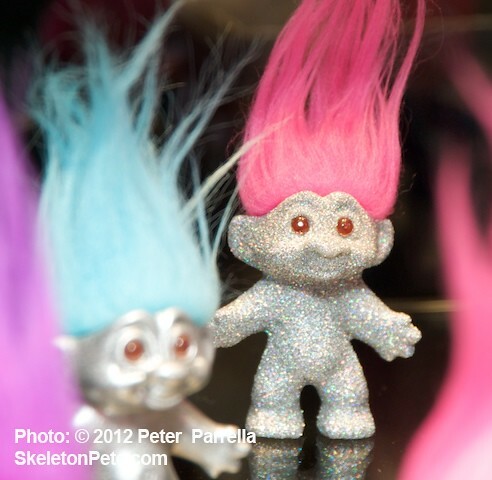 We’re happy to announce that we’ll be reporting from Toy Insider‘s Sweet Suite Event. The list of companies represented has grown immensely over the last 8 years. 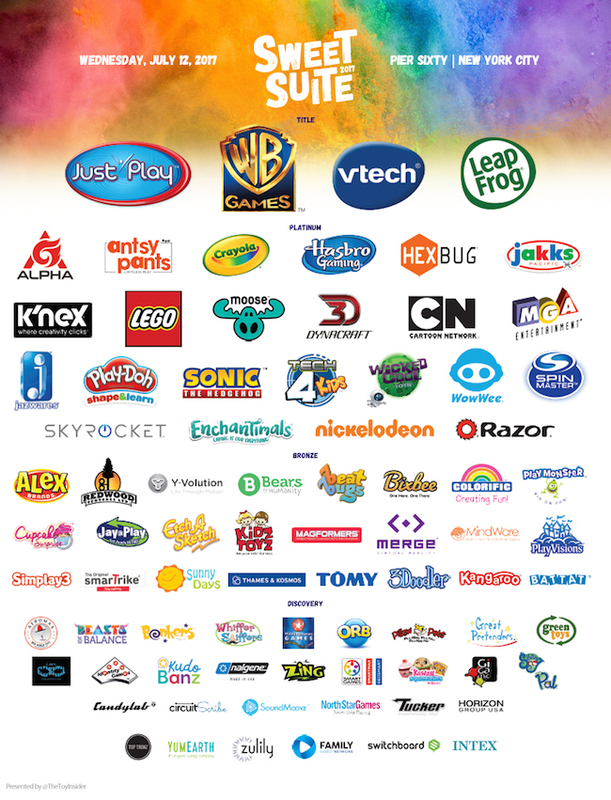 As you can see from the poster above an impressive array of toy makers will be exhibiting their products. We’re excited to once again have the opportunity to be among the first to demo and share information on the latest toy trends for the 2017 holiday gifting season. To get the most of our coverage, follow us on our social media accounts where we’ll be giving highlights as the event unfolds. 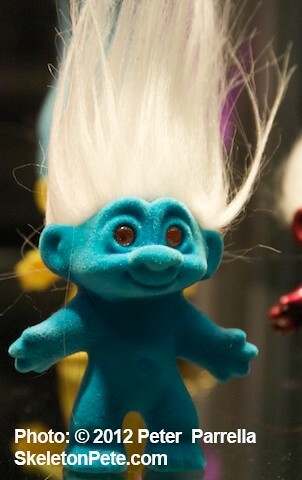 On July 25, 2012, Dark Horse Comics under license agreement with Dam Things will begin offering a new line of designer vinyl Good Luck Trolls. 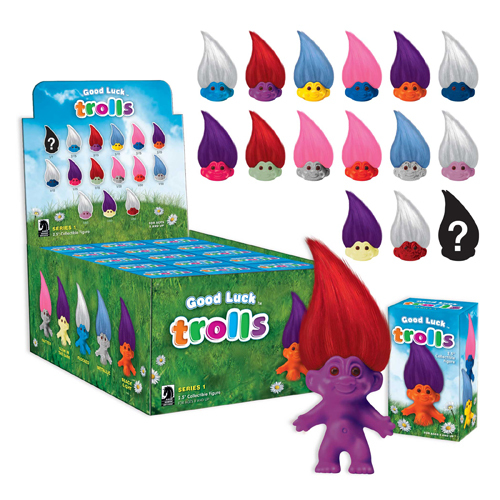 All collectibles fans have no doubt encountered the lovable smiles of the classic Good Luck Trolls in some shape or form over the last half century. Their original countenance was created by Danish woodcutter Thomas Dam in 1959. 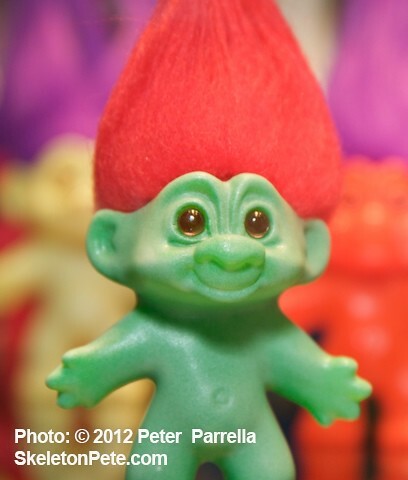 Dam chose to eschew the evil Troll demeanor of the Three Billy Goats Gruff fairy tale characters for an affable grin and “hug me” pose and they quickly became a pop culture phenomenon. Copyright legalities during the 1960’s saw the product go into the public domain in the United States with a number of companies issuing their own versions. 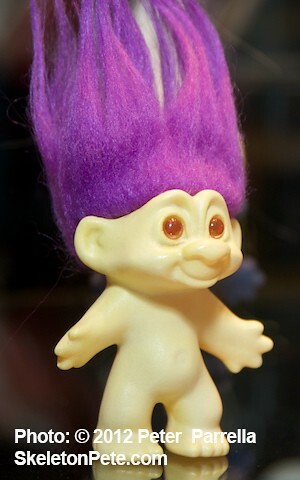 I still have a couple of vintage Uneeda Doll Company “Wish-Niks” in my collection. Russ company outfitted them to represent different holidays and vocations, miniature bristle haired versions came out of gumball machines, they were ubiquitous. Reinstatement of the copyright came after Dam’s passing in 1989 and worldwide licensing is now administered by the Denmark based Dam Things. 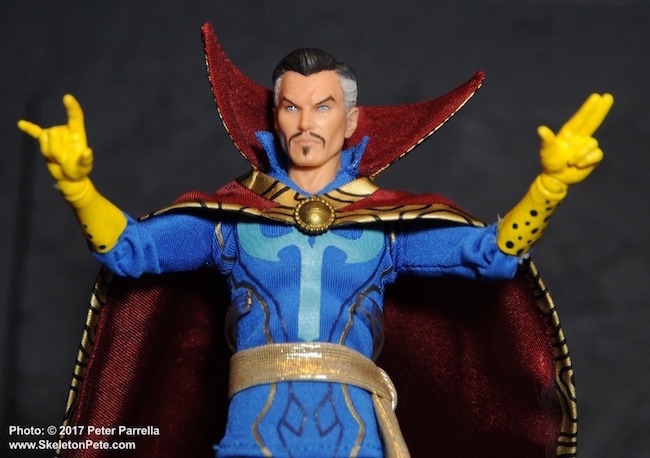 The first wave of 2.5” figures will feature an assortment of 15 body and hair color variations, including metallic, glitter, and flocked versions. Glow In The Dark and Black Light bodies are also in the mix. The “mystery box,” with characters both cardboard boxed and foil wrap sealed, offers a random purchase experience and an opportunity to trade with like minded collectors. There are “chase” characters with lower find probabilities and those ratios are printed on each vending display. 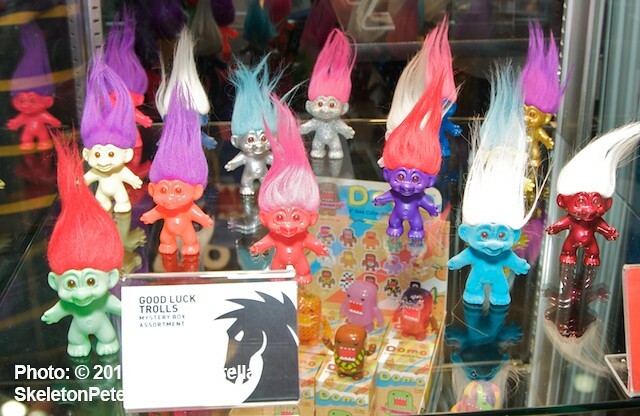 Lucky 2012 San Diego Comic Con attendees (July 12-15) will have a crack at purchasing a black light sensitive green Troll with white hair which is limited to 1,500 and exclusive to the Convention. 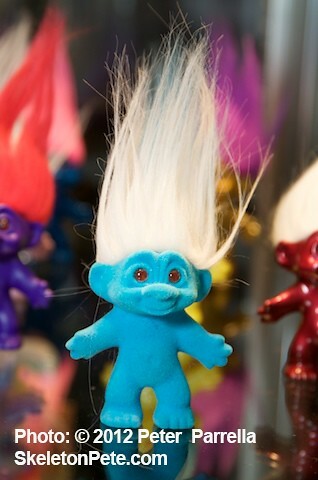 With Dreamworks Animation announcing the Good Luck Trolls as their next feature subject (Chloe Moretz and Jason Schwartzman are on tap for voice work) the franchise should see a renaissance and a new fan base for the 21st Century. 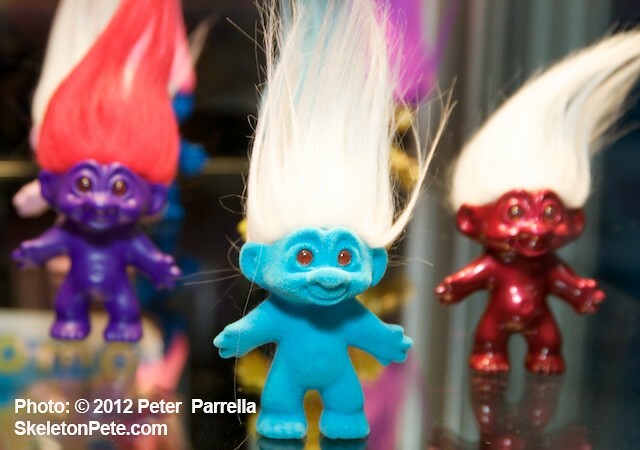 I captured these images at the February 2012 Toy Fair in NYC when this product was in pre-license approval prototype. Please check vending display boxes for actual color and surface combinations available in Series 1. Happy Collecting.